Make sure the potassium supplement you take passed our tests and is right for you! If you use a potassium supplement, it's important that you choose a product with the right dose that safely delivers what it claims. 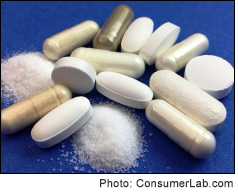 But beware: We discovered arsenic contamination in pills from a popular brand, and the labeling on some supplements can mislead you into thinking you are getting a lot more potassium than you really are. In our potassium supplement review we tell you what to expect from these products. Moreover, we identify several brands that contained what they claimed, did not exceed strict contamination limits for arsenic, lead, or cadmium and properly released their ingredient. We also found that you can get high quality potassium for a little as 1 cent per dose, rather than spending many times more. Potassium supplements treat and prevent potassium deficiency, which can occur due to diuretic drugs ("water pills"), prolonged vomiting, diarrhea or laxative abuse. Potassium may also help reduce hypertension -- particularly in people who consume too much sodium. You must be a ConsumerLab.com member to get the full test results along with ConsumerLab.com's recommendations and quality ratings of potassium supplements — including potassium-magnesium combinations. You will get results for 16 supplements — 11 selected by ConsumerLab.com and five which passed testing in our voluntary Quality Certification Program, as well as information about two supplements similar to one that passed testing.